A Tulpa is an intentional creation of the mind and even though it has its origins in the Buddhism of Tibet, it has existed ever since times of the first thinking man. For lay-persons, a Tulpa is an intentional creation of an imaginary mental being who exists separately in the mind of the creator and over a period of time gains the unique powers that are attributed to it by the creator. 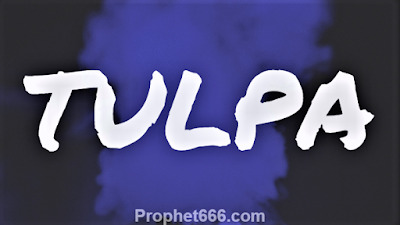 The powers of the Tulpa primarily depend upon the powers attributed to it by the creator and a Tulpa can be a guardian angel, adviser, helper, paranormal entity or any other being as visualized by creator or person who creates the Tulpa. Tulpomania or the method of creating Tulpas has become quite popular in recent times and these people who call themselves Tulpamancers adopt numerous methods aimed at creating a Tulpa of their choice. This throws up some very controversial questions that strike at the very heart of all established religions and their founders and even some of the established paranormal practises, including extra sensory perception. 1] Are Gods and Goddesses, Tulpas created over the centuries by some person or persons and implanted into the minds of the subsequent generations. 2] Are ghosts, spirits, demons, vampires and other ghostly beings unintentional Tulpas, implanted into the mind and the power or the degree of power by which they possess or scare an individual depends upon how they are visualized by the affected individual. If the individual imagines them to be most powerful and frightening then the level of possession or fear is extremely high and it becomes difficult to exorcise the individual of these strong thought-forms that have taken control over his mind. Can all cases of possession be termed as unintentional Tulpomania, when the Tulpa implanted into the mind of an individual become more powerful than the host and takes over the control over the mind and sometimes even the body of the host. 3] Can supernatural and paranormal activities be remotely controlled or practiced by a person who has full control over his Tulpas and has created them in a specific customized manner and implanted specific unique powers into them for specific purposes. 5] Are mediums and others who regularly communicate with the other world or psychics or others of their kind who forecast the future or have someone’s future whispered into their ears, conversing with their Tulpas who exist only in their minds. 6] Are sightings, projections and visions of various supernatural beings, the sightings of Tulpas who have gained an existence of their own, which is independent of the host. There are certain references in Buddhism, which say that Buddha and other Buddhist monks were able to create most powerful magical beings. They also say that Buddha was able to simultaneously appear at more than one places simultaneously by creating Tulpas of himself. There are also many such instances of saints and other spiritualists who appeared or manifested at multiple places at the same time. There are many such instances in Hindu Puranic Texts and other scriptures about the creations of the most powerful kind of mystical good and evil beings that can be termed as “Tulpas”. These Tulpas were created for specific or special purposes, I will share more information on this topic in some other posts and how to create your own personalized Tulpa. Ashta Siddhi or the eight main superhuman powers have been spoken about in the Hindu religion since the time of the Vedas. A possible explanation for the above can be that Buddha and these other monks and saints had gained Prapti Siddhi or the power to be present at multiple places at the same time. Prapti Siddhi is one of the Ashta Siddhi. To possess all the Ashta Siddhi is next to impossible and if one were to gain these eight superhuman powers, one would become God. Shri Ganesh and Lord Hanuman are the Hindu Gods who had the power of Ashta Siddhi and were capable of anything. Note- The Human mind can be compared to a fathomless ocean because the depth of the mind is limitless, an individual can achieve anything in his mind and nothing is impossible and any and every thing can be visualized in the mind, including Tulpas. Sir agar kisi ko tantrik vidya nahi aati aur vo sikhna chahta hai to vo kese sikhe? आध्यात्मिक उपलब्धि के लिए मन्त्र साधना की जाती है ,जिससे ब्रह्मज्ञान ,देवदर्शन ,भगवान् का सानिध्य प्राप्त हो .इस तरह के मन्त्र सात्विक होते हैं .भौतिक उपलब्धियों के लिए तंत्र साधना प्रभावशाली कही जाती है .सांसारिक सुख बैभव के लिए यंत्र साधना का भी प्रचलन है .तंत्र साधना को तामसिक माना जाता है .तंत्र शास्त्र के सिद्धांत गुप्त रखे जाते हैं और इसकी शिक्षा लेने के लिए मनुष्य को दीक्षित होना पड़ता है .प्रायः मारण,उच्चाटन,वशीकरण के लिए तथा अनेक प्रकार की सिद्धियों के लिए तंत्रोक्त मन्त्रों और क्रियाओं का प्रयोग किया जाता है .सामान्यतः सात्विक मन्त्रों का ही जप और पाठ करना चाहिए ,क्योंकि इनसे सभी शांतिकर्म संपन्न होकर सुख बैभव,धन संपत्ति ,मान सम्मान प्राप्त किया जा सकता है .तंत्र शास्त्र के इच्छुक को योग्य गुरु की शरण लेना चाहिए ,यद्यपि आज के युग में सही गुरु मिलना दुर्लभ है . इस पोस्ट में TULPAS का विवरण पढ़कर श्रीदुर्गा सप्तशती का दसवां अध्याय याद आया .शुम्भ ने देवी से कहा-तू बड़ी मानिनी बनी हुई है ,परन्तु अन्यों का सहारा लेकर लड़ती है ?देवी ने कहा-'ओ दुष्ट ,मैं अकेली ही हूँ .ये सब मेरी बिभूतियाँ हैं ,अतः मुझमे ही प्रवेश कर रही हैं .' तदन्तर समस्त देवियाँ अम्बिकादेवी के शरीर में लीन हो गई .उस समय केवल अम्बिकादेवी ही रह गई .मुझे छाया पुरुष साधना (हमजाद सिद्धि ) का ध्यान आया .हर इंसान के दो वजूद होते हैं.एक जिसे हम हर पल महसूस करते है जो हमारे साथ ही चलता फिरता है , हमारे साथ हमारे समान ही जीवन की सुख सुविधाओं का उपभोग करता है, लेकिन दूसरा वो जो हमारे साथ जन्म लेता है, रहता है पर हमारे मरने पर भी उसका अंत नहीं होता है .पर शक्ति सामर्थ्य में वो हमसे कही बहुत ज्यादा होता है , असंभव को भी संभव कर सकता है.अपनी छाया (परछाईं )हमारे अंतर की ऊर्जा जो सकारात्मक या नकारात्मक दोनों हो सकती है को जब हम अपनी परछाई से जोड़ देते है तो वो भी सजीव जैसा बर्ताव कर सकती है।इसके लिए 2 माध्यम (पहला - आईना / दर्पण ,दूसरा -दीपक या मोमबत्ती )होते हैं .